The exclamation mark, also called an exclamation point, is a punctuation mark that goes at the end of certain sentences. It’s less common than the period or question mark, but it’s very easy to use. Some might say it’s too easy to use. What Is an Exclamation Mark For? Periods go at the end of declarative sentences, question marks go at the end of interrogative sentences, and exclamation marks go at the end of exclamatory sentences. An exclamatory sentence is one that expresses a strong or forceful emotion, such as anger, surprise, or joy. I got a perfect score on the SAT! Get out of my sight! 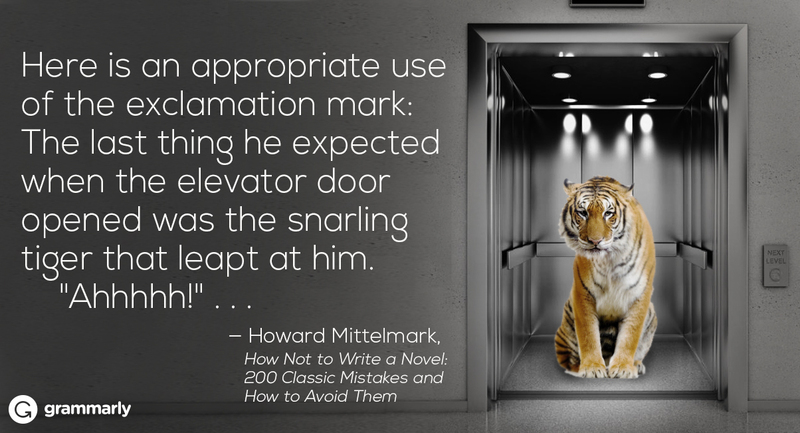 Exclamation marks are also commonly found with sentence fragments or sudden interjections. Occasionally, you might see one at the end of a sentence that is phrased as a question. Careful! That spider is poisonous. Holy cow! How could I have forgotten to pack underwear! Put the exclamation mark inside the closing quotation marks if it applies to the words enclosed by the quotation marks. “There’s a spider on my arm!” yelped Jeremy. If the exclamation mark applies to the sentence as a whole, then place it at the very end. And then the paramedics tried to tell Jeremy it was “only a spider”! Put the exclamation mark inside the parentheses when it applies to the words inside the parentheses. Jeremy didn’t find out until later what kind of spider it was (a black widow!). Put the exclamation mark outside the parentheses if it applies to the whole sentence. They settled out of court and Jeremy got a million dollars (cash)! Using exclamation marks and parentheses this way is relatively rare. Congratulations! You just learned everything you need to know about exclamation points.